Leading uphill from the Grizzly Giant, the winding, forest track eventually leads to the Wawona Tree, once the oldest and most famous tree in Mariposa Grove. Named after the Native American word for big tree, the Wawona Tunnel Tree stood 69m (227ft) tall with a circumference at base measuring 27m (90ft). In 1881, sensing a business opportunity, the Yosemite Stage and Turnpike Company paid two labourers – the Scribner brothers – $75 to cut a tunnel through the fire-scarred trunk. At 2.1m (7ft) wide, 2.7m (9ft) high and 7.9m (26ft) long at the base, the tunnel was large enough to allow a horse and carriage to pass through, and became a major tourist attraction. Over time, visitor laden carriages intent on a good photo opportunity were replaced by convoys of cars and charabancs until 1969, when, weakened by the unnatural chasm cut through its base, the Giant Sequoia toppled over under the weight of a heavy snow storm. 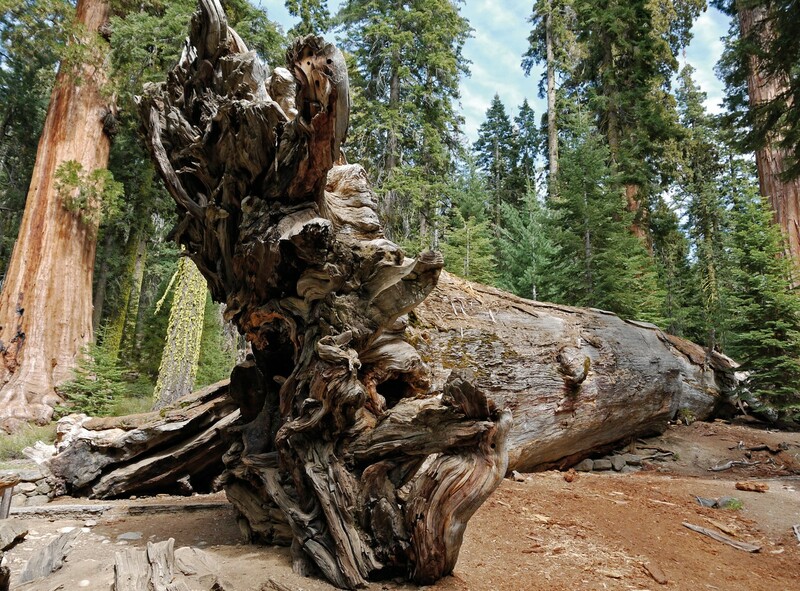 Now known as the Fallen Wawona Tunnel Tree, it remains where it fell, a reminder of its former celebrity status. At an estimated 2,100 years old, the tree may have seen its life cut short by a thousand years. But the high tannin content present in Giant Sequoias – a substance that helps protect the trees from fungal infections, insect attack and fire, responsible for their characteristic red colour – could preserve the giant in its fallen state for another millennia. Further back down the hill, close to the Grizzly Giant, the California Tunnel Tree, similarly cut in 1895, still stands. Julian Hight is a designer, photographer and musician. In his self-published book “World Tree Story”, Julian goes worldwide, collecting stories about important trees all over the world. When viewed in a single book, this stunning collection of trees, along with their history, legend and mythology, presents an extraordinary record of the rich variety of ancient trees worldwide, whilst also telling a human story. A celebration of our ancient trees through words and pictures, the book ultimately calls for their preservation and conservation. For more information, please check his website and his facebook-page.